My well-being sanctuary is not only a place for peace, but also for productivity. They both go hand in hand with my happiness and well-being. I adore work-chill sessions. What better way to encourage such a lifestyle than to dedicate at least one area to becoming a well-being sanctuary. I've gone through many renditions of this special space over the years and various places I've lived. My husband and I have recently bought our first home and it is time to build that space once again! I use the Yeelight, a strip of light that can be adhered to a surface and create glorious combinations of light patterns on command. There is an app that connects to the actual lights via wi-fi connection. The Yeelight works with Google Assistant and Alexa. We have both smart home devices in our home because we do the absolute most. I also enjoy shopping for different styles of lamps. Finding a really nice lamp serves both aesthetic and functional purposes. Putting lamps in various corners and sections of one room creates sub-sections of the room to inhabit. Houseplants instantly bring life, energy and beauty into a space. I like the idea of having potted plants that sit on a surface as well as plants that can be hung. Keeping plants around have been shown to reduce stress, improve productivity and concentration. Indoor plants also have the power to boost your mood and I believe this completely. I currently have three plants in my collection and they give me great joy. Luckily, I chose plants that work well with the type of light my house gets during the day. I do best with plants that require moderate water and light. I remember growing up with indoor gardens at both my grandparents home and my own. The idea of creating an indoor plant sanctuary is both intriguing and frightening to me. I would love to have a reasonable oasis of plants surrounding me, but I know that I must work my way up to being able to take care of each plant. The last thing I need is a bunch of dying plants everywhere. My previous plant failures can be chalked up to poor lighting in our old apartment, as well as not knowing how to tend to each individual plants needs. Plant sanctuary....it's definitely future goals. I need that green. Candles are my favorite. They provide me with focus, peace, and open additional channels of happiness for me. I need as many channels open as possible. I need as many candles as possible. Although, I don't often light more than one at a time. I set up different atmosphere formulas depending on what I am working on. If I don't have enough candles to burn for hours and hours, I will selectively light candles only during my writing sessions whether they take place in the morning or at night. When I was doing my morning pages, I would light a candle every morning to start off the session. When I wrote the first draft of my novel, I always had a novel-writing candle ready to go. I've also used incense pretty heavily in the past. I'd have to make special trips to my favorite record store to get the kind I liked. Once I got pregnant, they became too much for me and I haven't yet fully tapped back into them yet. I used to stick the incense in my candles as a holder. An always regrettable decision. I'm sure anyone who has grown up making pillow or blanket forts can testify to their magic and greatness. I was thinking of how to create an upscale version of a fort to stay consistent with the direction I am going with my set up. The plan is to dedicate one corner of the room to embody the 'fort feel'. I have a circular based linen canopy that came with a beautiful chair my husband got me a few years ago. Some sort of light linen or sheer curtain material would work well to hover over and enclose a corner of the room. A lot of children furniture vendors have them as well. I think adults need them too! Lights may be attached to the inside top portion, so that there may be a light cloud of brilliance sitting up above. You can also create a full pillow fort, which I plan to do very soon as well. I want to create an adult fort and a kids fort for my babies. I will probably create a separate post about this topic alone because blanket forts are magic. Tangible books are needed in this space. There is a two-for-one opportunity brewing here with the pairing of a small collection of books and an interesting bookshelf fixture. I'm thinking about either buying the hard copies of the most recent audio books I've absorbed. Another option is buying a small collection of books that are similar in theme, such as motivational triggers, or even a fictional series. Choosing a bookshelf is going to be just as exciting as there are so many interesting fixtures out there to accent whatever direction the vibe is going. I've always wanted the invisible bookshelf. They make the books look so clean, minimal and magical. Get some stuff up on the walls. Here is another opportunity to have multi-functional pieces. Wall art can work with supporting your aesthetic as well as inspire or trigger a certain action or mood. Society 6 is one of my go to places to buy artwork if I'm not buying directly from artists. Society 6, if you don't already know, is actually comprised of artists who sell their work offered in various forms. You can find an art print as a poster, tapestry, pillow, rug, mug, and almost anything else you can think of, with some exceptions depending on the artist. I've bought things from them on a number of occasions. Typographical posters are spectacular as I am obsessed with typography. Get a poster of a phrase or affirmation to get you aligned with whatever purpose your sanctuary serves. Make your own posters, print your own photography and be surrounded by your own creative juice if you desire. Buy art from the awesome artists you follow on social media. You can use this as an opportunity to support others, unlock your own creativity, or just have fun curating and collecting prints or original works that inspire and please you. And just as an added bonus, I have seriously considering putting up wallpaper or wall decal on an accent wall of a room. In my experience, wallpaper usually gets a bad, outdated rap. But there are some vendors that have cool designs that work was an accent wall or even used a wall art. A System of Sounds. Wonderboom. Record Player. Within my set up, I always decide whether or not I want lyrical music, instrumentals, ambient sounds, spoken word such as audio books or podcasts, or silence. This all depends on what task I am working on at the time. If it is non-fictional writing I am doing, I usually go for lyrical music. For fictional writing, I default to classical or jazz music if I already know what the scene is going to be. When I'm struggling a bit and really need to focus in deeply, I have to move to ambient sounds such as a fireplace, stream of water or even the deep hum of a factory. If I am doing research or pretty much anything else like mild design work etc..I can throw on an audio book or podcast. I love to either be in a mode of input or output. If I am not creating, I am intaking. If I am doing neither of the two, I am purposely resting, relaxing and recharging. The means in which I absorb my audio are either directly from my phone speakers themselves or in my headphones, my Wonderboom (favorite), or through the network of Google Home speakers we have set up throughout the house. My favorite speaker in the world right now is my Wonderboom because it is so compact, powerful and mobile. It's my little bluetoothed treasure I keep everywhere with me. The sound is phenomenal and penetrates so well in a variety of atmosphere sizes. It is perfect for a well-being sanctuary. It also has a pretty solid battery life and is pretty much resistant to impact and water. I love it so much, I'm literally obsessed with it. It's a comfort object for me. But before my Wonderboom, my previous sanctuary was filled with the sounds of my record player. There is a whole experience wrapped up in buying and playing records that just can't be beat. Airflow is such an important element of my atmosphere. It determines my physical level of comfort. It determines whether or not I get to sleep at night. I usually must have some sort of window open, or fan on at all times. Stagnant rooms stifle my body and mind, and generally make me uneasy. The perfect temperature, air flow, and water content in the air can contribute to great joy whether or not you are conscious of it. One thing I have planned to do is add a diffuser to my office. 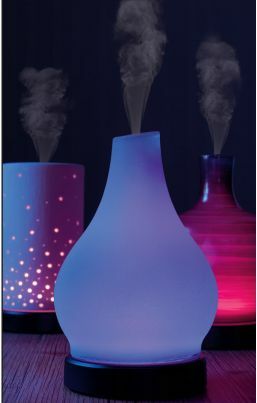 I saw a specific type that gently lights up and changes colors in addition to streaming fresh, crisp scented air. I used to have a humidifier thrown into the mix, which really helped because our old apartment was extremely dry. Add a bit of moisture into the air to make it more livable and breathable if necessary. Having a shelf somewhere hold a collection of tea for any occasion or purpose is always something I am striving for. But the question would be how to integrate something that would normally be found in a pantry, into a well-being sanctuary that is separate from the kitchen. In the past, I've bought an electric kettle that boiled water so I could make tea anywhere I wanted. I need to get another one of those as it was pretty handy. I ended up throwing mine away during one of my infamous purging sessions. But of course, it's really not that serious. I can just go make a cup of tea and go sit back down in my space. It would be nice to have a tea kettle nearby on a tray. I'll probably just do that. Pillows + Throws. Cozy Rugs. When I'm up flying in the air, floating through the clouds, I imagine myself buying space up in the sky and making home in one of the patches of clouds. If only that were possible.. But one thing I can do it recreate the general feeling of soft, cozy comfort by adding in fluffy pillows, smooth throws and cozy rugs. I plan on buying another office chair and sprawling a miniature, furry white throw on its back. I want pillows in the fort corner, because what's a fort without pillows? And lastly, I want a gorgeous rug that's not too low or too high in pile height. I'm looking for a clean but cozy feel. So that's about it for now. There are many other elements that can be infused into this mix, but this is a pretty nice start. I have actually been re-creating my wellness sanctuary while writing this post. The reason I enjoy writing out all of this information is because I am pretty much living everything I discuss. Make your sanctuary! It is important. You don't even really need to buy anything. Place a lamp in a corner, draw a picture and hang it up. Find a book. Pin a sheet to the ceiling and make a cup of tea.